Another fantastic product of Colorado – The Book of Mormon, created by Matt Stone and Trey Parker – the guys who brought you South Park. I kicked myself for not seeing the most recent show here in Denver, but will definitely be ready when the tour returns in 2015! Check out this fantastic review from Bucket List Publications. Make sure you stop by their blog and show ’em some love. The Highlands of Denver is a place we haven’t ventured to very much as of yet; but last Friday, we changed that! Denverspeax decided it was time to go on our first, dedicated Highlands adventure. This is where we found a quaint, down-to-Earth part of town chocked full of thriving, small businesses. Our first stop was for lunch at The Matador, located at 32nd Ave in the Highlands. The Matador was one of the places we visited, and, boy, we’re glad we did! Like we were regulars, the bartender greeted us immediately as we walked in. Sitting at the bar, he helped us with drinks, suggested chips and salsa for a starter, and grabbed menus for us to peruse as soon as we sat down. In addition to the appetizer, Steven and I purchased a Carnitas Taco Plate to split; the meal included two tacos on flour tortillas with shredded pork, shredded romaine, garlic sour cream, and Guajillo chili sauce along with large portions of black beans, rice, and spicy pico de gallo for added spice and flavor. We were told that their tortillas are one of the only products that are not made in house, from scratch. Carnitas taco plate from the Matador – check out other mouth-watering, Tex-Mex cuisine by clicking on the picture above to be taken to their menu! Credit: Kirsten Ebey, Dec 2013. True to the Tex-Mex style of cuisine, both American and Mexican influence is present within their Carnitas. The burst of garlic in the sour cream compliments the sweet and tangy shredded pork; the chili sauce grouped with the pico adds that Mexican kick, welcoming a cold, limed and salted Pacifico on draft. Steve and I split the above plate, and were completely stuffed. We cleared the entire thing, and honestly, could have stopped there…but we found ceviche listed in the appetizers section of the menu. Please note, if ceviche is on the menu, we will order it. We gravitate to ceviche, and have to try any and everyone’s! The ingredients are so incredibly fresh, and grouped with the saltiness of the homemade chips makes for a fantastic pairing. We finished every tart, chunky bite while draining another bowl of chips. Check out the tequila bar – there are so many different premium bottles! Credit: Kirsten Ebey, Dec 2013. Aside from great food, Matador offers a large variety of tequilas. Many of which are on display behind the bar, reflecting light from the sunshine outside. Sounds like a place for tequila connoisseurs, carrying over 120 superior tequilas. Be sure to stop by and check the Matador. Whether you’re looking for a snack, a full meal, a tequila sampler, or just grabbing a beer in the neighborhood, The Matador will satisfy your craving. Check them out on Facebook to learn more. 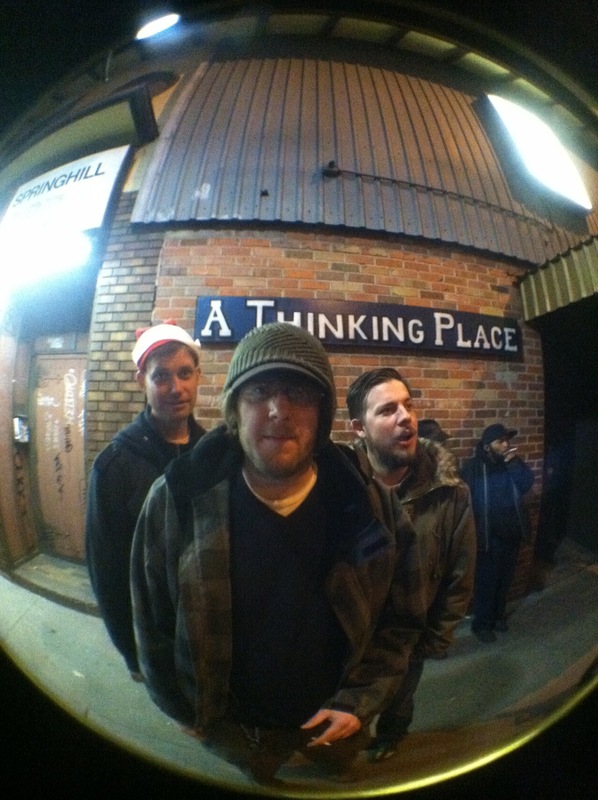 If Denverspeax had a band, this would be our representative band photo – eat your heart out. Tonight, we hopped “the 15” bus, and wandered on down to Sancho’s on Colfax; it’s a “thinking place”. Actually, it’s a really relaxed, chill bar to meet and reunite with good friends, new and old. The Grateful Dead is blaring, and I can’t help but live up to the mantra, “a thinking place”. So many things to think about and tackle for 2014. We are so glad you’ll all be there to witness and support. Without you all, there wouldn’t be any thinking going on at Sancho’s tonight. After brunch at Osteria Marco yesterday, hundreds gathered in Skyline Park downtown to watch tuba players from across the country to play Christmas carols. Ranging in age from 6 to 90 years old, and with a variety of tubas, the group played for an hour. Not only was there beautiful music, singing broke out through the crowd as well. We can’t wait for next year! What a great way to join the community in getting ready for Christmas. Check out this video from last year’s TUBACHRISTMAS in Denver. This year’s TUBACHRISTMAS concert will be held at Skyline Park, 17th & Arapahoe at 1 pm, this Sunday, Dec 22nd, 2013. This provides ample time to catch brunch beforehand! Hope to see you all there for this great event. We’ve done our research by being put through the Colorado Gift Basket wringer, and are here to save you from having to do the same. Here are our two favorite companies we’ve come across that pride themselves on creating beautiful and thoughtful gifts, utilizing Colorado chefs, artists, and companies. Completely Colorado brings local vendors together in an online venue setting. Not only can you purchase single items, but they also combine different products of different local businesses to create outstanding gift baskets at more than reasonable prices. The website is very user friendly, and has a variety of products from food, to jewelry, to yoga mats! We purchased two of the Taste of Colorado Gift Baskets to send back home to Michigan, and can’t wait to hear the feedback! Colorado Crafted presents carefully and creatively crafted boxes containing local artisan specialities. They scoured Colorado for delicacies so you don’t have to, grouping these delicious morsels into a variety of gift boxes for purchase. Quantities of items are limited due to the small supply created by each local artisan, creating even more of a crave for these extravagant boxed gifts. I know someone who will be impressing their boss this New Years! There you have it – two exceptional websites offering amazing products that can be shipped to family and friends (or bosses) afar. They don’t have gifts solely for the purpose of Christmas – think of them for a friend’s birthday, or an anniversary….. or for yourself because you’re so awesome. Stop by and check them out! 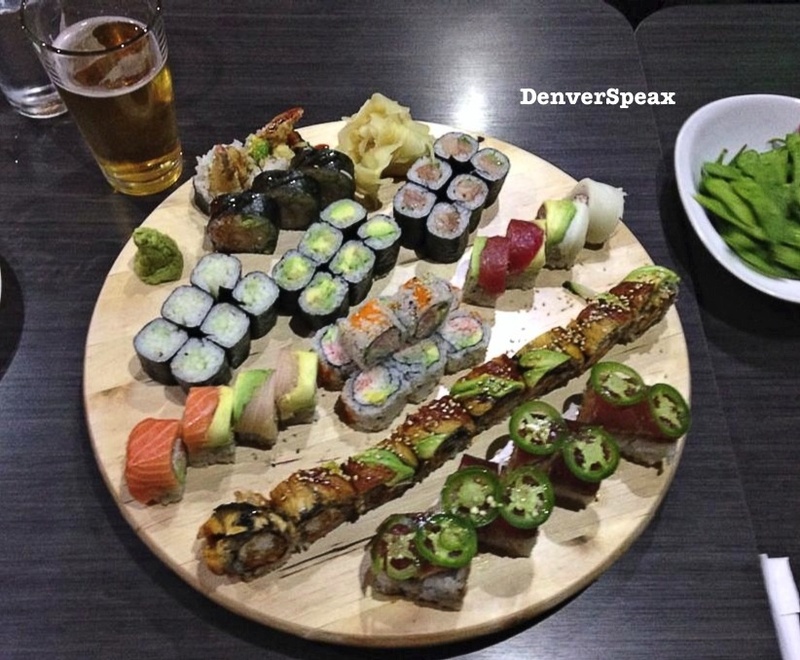 Sushi Bay 17 – Creating raving fans, one Denverite at a time. Over the past few months, an overwhelmingly amount of Denver friends have asked, “Have you been to the new sushi place on 17th?” and “Hey, have you been to Sushi Bay 17?”. All questions were accompanied by positive feedback, “Dude, you HAVE to go…” With this many people talking about it, in such a positive light, we had to go check it out! A band of 5 awesome women gathered at Sushi Bay 17 last Thursday for their group-formed, monthly Ladies Night to see what all the talk was about. Denver, CO 80218 within the City Park neighborhood. They have a parking lot as well as plenty of on-street parking. Weather permitting, we always suggest riding a bike, especially through this great neighborhood. Together, we ordered edamame for an appetizer, 9 sushi rolls, a few miso soups and one ginger salad. All of the food was very fresh, and beautifully presented. The ginger salad is a heaping portion, which was surprising at $3; even better, the ginger dressing is incredible! The amount of tangy and spice was just right, which has been hard to find in the past. The edamame were warm with the perfect amount of sea-salt – they also offer edamame with different seasonings on them, which we will have to check out next time! Take a look at the full menu from Sushi Bay 17. Out of all of the rolls we ordered, house specials and old classics included, the Spiderman definitely received the most raving fans. Each roll was presented beautifully, with fresh ingredients that all worked well together; after this experience, I feel Sushi Bay 17 is one of those restaurants that you can close your eyes and choose sushi at random, never getting a bad roll. Although Sushi Bay 17 is moderately priced, they run so many great specials! Daily Happy Hour specials on sushi, appetizers, and drinks occur from 3 – 6 pm, and AGAIN at 9pm – close. While we were visiting for Ladies Night dinner, the Broncos game was on, which meant $2 short, draft beers. On Sundays, order the all-you-can-eat sushi option for $27.95 per person. For our friend Annelise, this means unlimited Spiderman rolls on Sunday for about $30 bucks – how can you beat that? Our bill averaged $20 per person, plus tip, and we were all fat and happy. Not one piece was left behind. Sushi Bay 17 also has a wide variety of amazing-sounding desserts, but unfortunately all of us were too full to try them. Desserts are definitely on the list for next time! The price is inexpensive comparing the value of service, atmosphere, and attention to detail with the products that Sushi Bay 17 provides. We can’t wait to bring more people there and create additional raving fans! 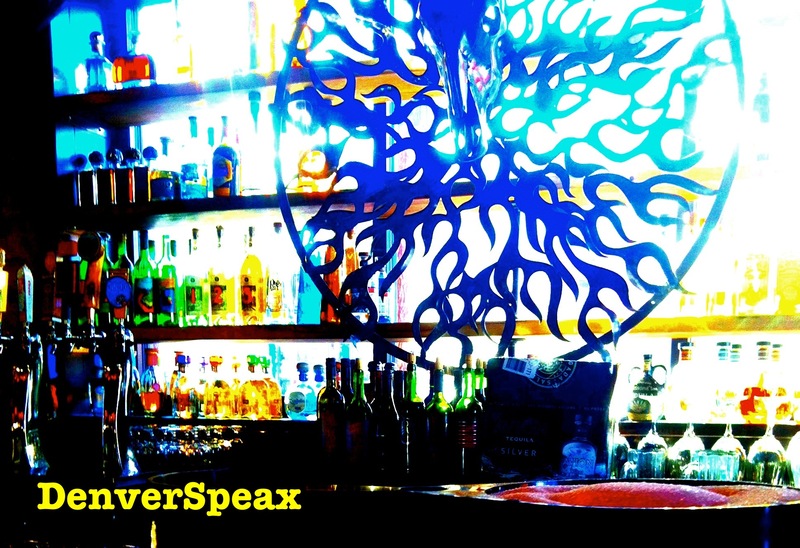 DenverSpeax is on Facebook – check us out and let us know where to go next!